Posted on June 18, 2016 by Redfaery	This entry was posted in Resources and tagged Buddhism. Bookmark the permalink. By “ghost” do you think that refers to astral beings, like living a life on the astral as opposed to physical reality? One of the theories I’ve reached is that spirits aren’t necessarily liberated from samsara, which is what I used to think. I think they’re bound to the wheel and the astral is a part of that wheel. So I’m fascinated that you mentioned ghosts as a realm of incarnation. “Ghost” seems to generally refer to *malignant* spirits. 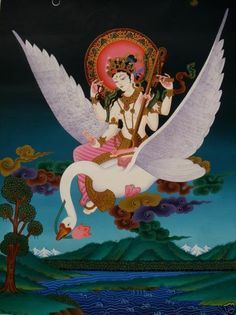 I don’t know what orthodox Buddhist teaching would be about the astral realms, since I’ve never had that conversation with a teacher, but a lot of the things I’ve read make me believe that yes, the astral realm is DEFINITELY part of samsara. It is pretty reassuring to think of the astral as part of samsara, given how becoming a spirit-worker SHOOK UP all my naive ideas about how enlightened spirits are. It’s also hugely helped with my duality vs non-duality conundrum which was confusing me. The astral has spirits who form identities. So the fae think of themselves as fae, the divine nagas think of themselves as nagas, the elves think of themselves as elves, etc. So they have an identity that they are attached to, therefore they have an ego-self, therefore they can’t actually be liberated from samsara. And when I put it that way, I felt like my mind was blown.